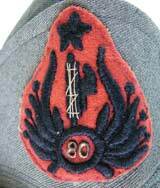 Forage cap mod. 40 for Colonel Commandant of 80° assault Legion "Alessandro Farnese" (Parma). Produced by ZENA Torchio e Borgioni - Genova. Distributed in Parma by the store "La Casermetta".